Click on the graphic to see an expanded view. When an environmental disaster strikes, the goal of first responders is to reduce immediate risks to human health and the environment. State and federal agencies work to contain the oil or hazardous substance, and clean up affected areas. For vessel groundings on coral reefs, this may involve stabilizing broken corals to minimize further damage. NOAA collaborates with response teams to protect coastal and marine resources and limit further impacts. If it appears that significant impacts may have occurred to natural resources, a Natural Resource Damage Assessment (NRDA) may be initiated. The NRDA process is driven by law, science, economics, and public input, and is led by designated federal, state, and tribal trustee agencies. We work together with the responsible partiesThe individuals, companies, or government agencies responsible for an oil spill, hazardous substance release, or ship grounding incident. to identify both negative impacts to natural resources and lost recreational uses resulting from the incident. Our experts determine the extent of injuries, and—with public input—the best methods, amounts, and locations for restoration activities. The rigorous scientific studies necessary to identify the magnitude of injuries may take years. 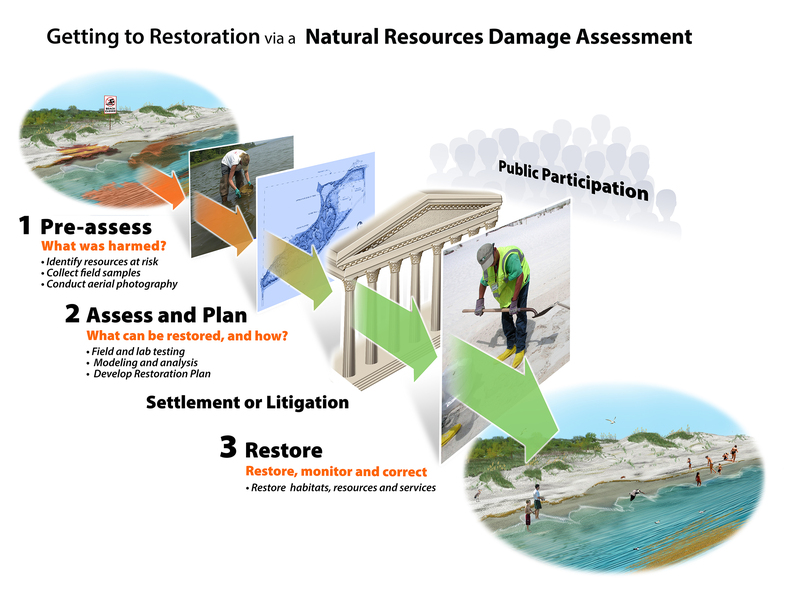 However, this process ensures an objective assessment—and that the public’s resources are fully restored. Restore the Environment: Implement projects to restore habitats and resources to the condition they would have been in had the pollution not occurred.